Whether it’s dealing with red, puffy, watery, itchy eyes, a constant runny nose or excessive sneezing, allergies can slow you down and be a real thorn in your side! An allergic attack can strike unexpectedly at the worst possible moment! And even though you’ve done your best to avoid things you know you’re allergic to, still you’re stuck with annoying cycle of allergy symptoms! Does this scenario sound familiar? Do you find yourself wondering why you’re plagued with these symptoms and how to get rid of them? If so, this article is for you! Let’s start by reviewing what allergies actually are, what causes them, and look at some tips on the best way to deal with them! Allergies consist of an abnormal reaction of the immune system to things that are usually harmless. When a person is allergic to something, the immune system mistakes a harmless substance for being a harmful one and tries to eliminate it from the body. A few examples of substances which typically can cause allergic reactions are certain kinds of plant pollen, mold, dust, pet dander, food or medications. These substances are called allergens. When your body recognizes something as harmful, your immune system swings into action by producing IgE antibodies for that specific allergen. These antibodies compel certain cells to release chemicals into the blood. An example of this is the chemical histamine. This chemical then acts on gastrointestinal tract, skin, lungs, throat nose or eyes and produces an allergic reaction. Your body then stores that response in its’ memory bank and replays that same response each time you come in contact with that particular allergen. 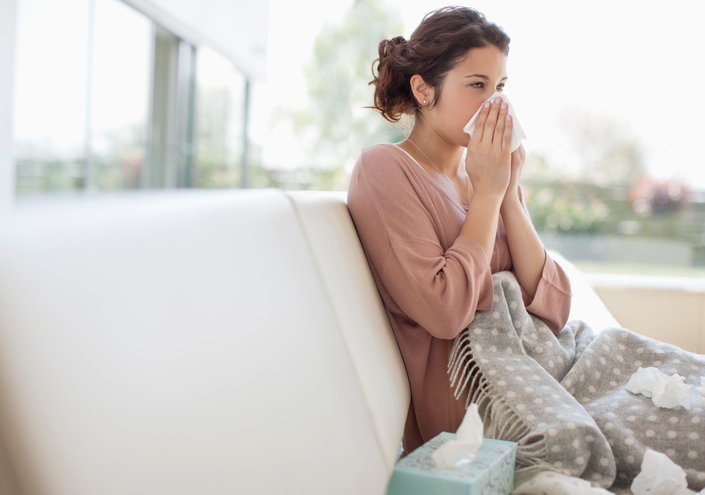 Allergy symptoms can range in severity from a simple runny nose to very serious and even life threatening reactions, such as anaphylaxis or shutting down your respiratory system! Certain types of allergies can initiate multiple extreme symptoms and, in certain cases, this reaction can become very serious and even life threatening! This condition is known as anaphylaxis. Symptoms of anaphylaxis include dizziness, swelling of the tongue, throat, lips and other parts of the body, trouble with swallowing and breathing, loss of consciousness, and even death! It generally occurs within minutes after exposure to the allergen, however, some reactions may take time (even up to several hours). For example, many people are known to have a peanut allergy or shellfish allergy and a severe reaction begins almost immediately after contact with those allergens. While an anaphylactic reaction is dangerous, the good news is that it can be reversed with immediate medical intervention, such as a shot of epinephrine. -Tingling in the scalp, feet, lips or hands. Anaphylaxis can quickly become a life-threatening situation! Time is of the essence! If you ever experience any of these symptoms, call for professional help right away! Use an epinephrine auto injector (Epi pen) if you have one and repeat it every 5 minutes to 15 minutes. You will still need medical attention after receiving the shots, even if the symptoms start to fade since there is still a chance for delayed reactions. If you use a prescribed epinephrine injector for emergency situations (Epi pen), make sure you always carry it with you EVERYWHERE! This includes wherever you go- to work, school, party, vacation, etc. If you’re a student, consult the school authorities if needed to decide where to store the injector so that you can access it quickly. Temperature affects the efficiency of the epinephrine so do not leave it in your car where it can easily get too hot! If your allergies are extreme, be able to recognize the symptoms of a serious reaction like wheezing and difficulty in breathing and act quickly. Follow the advice given by your doctor. Practice using the epinephrine injector with blank shots so that you do not forget how to use it. Some things to always keep in mind while using the injector include: Which end contacts the skin? Are there any caps to remove? How to hold the syringe and release the chemical. Where to give the injection? To clarify these things, ask your physician to give a demonstration. Visit the website of the manufacturer to get detailed instructions. The device may come with an extra syringe, which is not loaded with epinephrine so you will be able to practice the procedure and feel confident just in case you ever have to use it. If you think you are experiencing the symptoms of anaphylaxis, take the injection right away. If there is someone with you, ask him/her to call a doctor while you are giving yourself the shots. If there is no one with you, call for professional help right after taking the injection or visit the nearest hospital as quickly as possible, since sometimes you may experience a second wave of the symptoms. Make sure to carry the used container of epinephrine with you so you can show it to any medical personnel. Your Epinephrine injector (Epi pen) should be stored according to the instructions of the manufacturer, preferably in a cool place. Look for its expiration date and always get a new one if it expires. Hopefully, you will never have to use your Epi pen, but always be prepared just in case! As with anything in life, knowledge is power! The first thing to do is find out exactly what you’re allergic to. (You may be surprised!) Ask your doctor if he can test you for allergies, pinpoint the specific items that are giving you problems, then do your best to minimize and avoid them! Talk with your doctor about prescribing medication or allergy shots to help prevent or minimize your symptoms. When it comes to allergies, “an ounce of prevention is truly worth a pound of cure”! Do your best to identify and treat your allergies before they become a life-threatening problem! If you’re looking for the right doctor to provide allergy testing and set you on the right path to symptom-free living, Dr. William Cheatham is for you! Conveniently located in the Pompano Beach/Ft. Lauderdale area, Dr. Cheatham is recognized as one of the top family practice doctors in South Florida. Dr. Cheatham is committed to helping you achieve optimal health and even provides free allergy testing to help you reach this level! Take that first step and call us today at 954-364-3673 to schedule your appointment. You’ll be glad you did!